A fire-extinguishing system adapted to be installed above a stove top and to automatically extinguish a fire emanating from a stove top, the fire-extinguishing system including a fire-extinguishing device comprising a pressurized container body adapted to store a fire-extinguishing agent under pressure, a discharge outlet and a discharge head in fluid communication with the discharge outlet. Disposed within the discharge head is a plunger member configured to be retained within the discharge outlet, and a heat sensing element which is adapted to release the plunger element from the discharge outlet when a fire is detected. Once the release plunger is released from the discharge outlet, the fire-extinguishing agent exits the container body through the discharge valve and through a sprinkler head onto the fire emanating from the stove top. The fire-extinguishing system also includes a cut-off control mechanism for terminating power to either a gas or electric stove top by utilization of a thereto-sensitive disc which is activated by excessive heat. 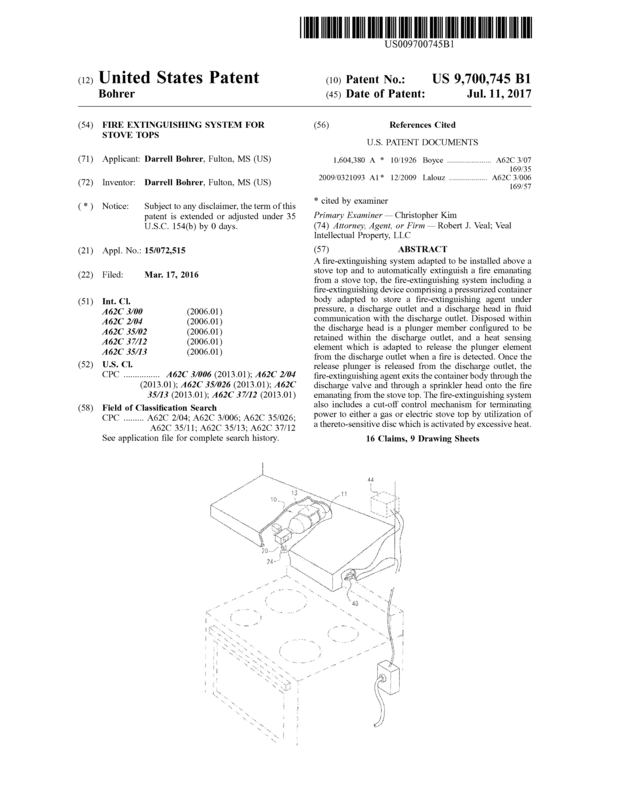 Page created at 2019-04-21 5:04:46, Patent Auction Time.